While the XTS' spate of processors and controllers isn't running the open-source offspring of Linus Torvalds, the game-changing infotainment intender known as the Cadillac User Experience (CUE) is. Buried deep within the dash is a three-core, ARM 11 processor, powering two displays: one eight-inch capacitive touch screen — the first non-resistive display to come to a production car — and a second, 12.3-inch fully-configurable instrument cluster mounted behind the steering wheel. Two of those cores adapt on the fly to handle voice commands powered by the same Nuance technology used by many automakers, along with Apple's personal assistant, Siri. But with CUE, everything is processed on-board. Because of that trick bit of natural voice recognition technology, and specifically its ability to listen for commands in-line, inputing addresses and performing point-of-interest searches is easily the best we've ever experienced in a modern vehicle. Rather than breaking out each portion of an address into dedicated fields, you simply have to speak an address (say, "123 Main Street, Cupertino, California") and CUE is smart enough to recognise the entire address in one shot. More impressive is the system's ability to take local searches — everything from "I need coffee" to navigating to a restaurant — process the voice command within a few seconds and deliver a result. This came in particular handy while trying to make our way to the test-drive lunch stop. Instead of having to look up the address, input it into the navigation system and wait for the routing to begin, we simply said the name of the restaurant and seconds later it was dialed into the nav. And even though we stumbled on our words, pausing momentarily and stuttering in the process, it still recognised where we were trying to go. That's a first and it's something we can't wait to see proliferate throughout other production vehicles. This same functionality extends to the app and audio integration, allowing the driver to say "Play Rolling Stones Radio" in Pandora or "I want to listen to 88.5″ without ever having to touch the screen, twist a knob or punch a button. Which is good, since there are few knobs or buttons to speak of. Aside from the redundant controls on the steering wheel (and there are several), the entire centre panel is made up entirely of capacitive, chrome-clad touch controls. The lower panel — which mechanically tilts upward to reveal a hidden compartment for stowing a phone, along with two USB ports for plugging in your mobile, MP3 player or thumb drive — houses controls for volume, climate, seat heating and cooling, plus "home" and "power" controls. Unfortunately, the very nature of capacitive switchgear means there's a subtle lag between pressing a "button", registering the input, delivering a haptic pulse, sending said input to the system and then eliciting a change in fan speed or volume level. It's the same gripe we have with the MyFord Touch system — further proof that good ol' knobs are still the best way to go, despite their lack of gee-wizardry. And this same lack of responsiveness can occasionally be felt when navigating the eight-inch central display. While the overall polish of the system is more than enough to impress, there's still a perceivable lack of smoothness and immediacy when switching through menus, navigating pages and swiping between screens. The situation is exacerbated by the occasional misinterpreted press on the screen, a product of small touch points that don't always register where you expect them. Equally jarring is CUE's ability to detect when your hand moves within eight inches of the screen, which then pulls up a series of configurable virtual buttons for everything from radio presets to frequently navigated addresses. When you pull away, the controls fade into the background. It's impressive to watch the system recognise your hand's proximity to the screen and then display a series of controls that would make the display look otherwise cluttered, but having some of these items statically placed seems like a more intelligent user interface choice for frequently selected options. That's one of the many reasons Cadillac is providing an iPad with every 2013 model to help consumers navigate the new system. General smoothness aside, CUE is one of the most attractive infotainment systems to date, mixing 3D graphics with colour icons and a beautifully rendered mapping display. And while the app selection is limited for now, with only Pandora, Stitcher and a pre-installed OnStar app available at launch, Cadillac tells Wired that an app store is on the way. 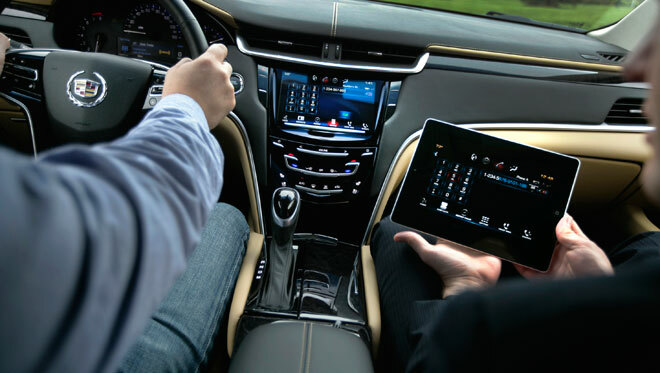 Java and HTML5 are make up the core frameworks, so once developers are granted access to the SDK, Cadillac expects as many as 30 apps to be available within the next year. But while we had our issues with CUE (growing pains, we're sure), the configurable display that takes the place of traditional gauges behind the steering wheel never failed to impress. Four different designs are available, beginning with a simple, three gauge cluster with engine revs on the left, speed in the centre and fuel, coolant and phone/navigation/audio on the right. It's the most traditional display and what most drivers will feel immediately comfortable with. The second display nixes all the round gauges for a digital speedo at the top, navigation instructions below and other assorted information flanking the sides, while an even more simple display — obviously aimed at some of Cadillac's ageing drivers — only shows speed, fuel level and a few other must-haves. Finally, there's a more enthusiast-friendly option, with an oversized tachometer and speedo, partnered with a 3D rendering of the vehicle along with tire pressures, engine temp, navigation and audio controls, all displayed clearly and vividly for the driver. We stuck with the latter during the majority of our drive. All this tech is pretty useless if the vehicle surrounding it isn't up to snuff. And here Cadillac has a winner, even though the XTS won't send chills down the spines of Audi, BMW and Mercedes-Benz. The exterior is an odd blend of bold and bland, while the interior is a beautifully appointed mix of leather, wood and contrast stitching (the purple thread in the Platinum models has to be seen to be appreciated). There's ample room for four people (five in a pinch), with leg and shoulder room abound, and a thoughtful, conservative approach to luxury that's been utterly lacking from most American automakers. The XTS' feels a bit more Japanese than German in execution, but injects a bit of emotion into an otherwise bland segment of upmarket rides. The overall length is on par with Audi's range-topping, standard wheelbase A8, but the interior dimensions and general size is more closely competitive with the slightly smaller A6, along with the BMW 5 Series and Mercedes-Benz E-Class. A 3.6-liter V6 engine putting out 304 horsepower and 264 pound-feet of torque is either sent to the front wheels or all four depending on the trim, and no V8 option is planned, despite most of the XTS' closest competitors offering some form of big or boosted drivetrains. A six-speed automatic is standard across the range, which nets acceptable fuel economy, despite coming in a few cogs short of other luxury players. We spent time in both a Platinum all-wheel-drive model and a front-driven "base" version, and found both to be pleasing steers that eschew the wafting heritage of past Caddys thanks to a rigid chassis and the standard fitment of Magnetic Ride Control, the same suspension technology that keeps the Corvette ZR1 and Ferrari 599 stuck to the road. The front-wheel-drive model felt more floaty due to the lack of additional grip and weight in the rear, while the all-wheel-drive version was far more planted and — dare we say it — mildly sporty. The steering and brakes were equally at home while navigating the congested confines of Los Angeles — they might not be as composed as the impressive suspension, but are easily up to the task at hand. But what exactly is that task? For Cadillac, the XTS is an attempt to reassert itself as the Standard of the World, and that starts with a competent chassis, a plush interior and a revolutionary in-car entertainment system. But with Cadillac still lacking a proper flagship to go up against the BMW 7 Series and Mercedes S-Class, it's still a ways away from regaining its former title, even though we've been assured numerous times that model is on the way. Cadillac's head exec confided in us that the XTS is "a bridge" for some of the brand's existing customers to move out of their ageing DTS and STS land yachts, but we'll call the XTS was it is: a tech-rich stopgap that points the brand forward. And with pricing ranging between the mid-$40,000 range up to near $US60k, the XTS is a solid alternative to the segment stalwarts, opting for comfort and convenience over sport and speed.